While dry conditions during the 2018 growing season didn’t stop all instances of foliar, stem and root rot diseases across Western Canada, pulse growers didn’t see the high levels of pulse or soybean diseases associated with warm, moist conditions. But that doesn’t mean scouting won’t be necessary in 2019. The main diseases in pulse and soybean crops are foliar diseases such as septoria brown spot, bacteria blight, downy mildew, stem diseases such as sclerotinia (white mould) and phytophthora (exclusive to soybeans), and root rots like fusarium, rhizoctonia and pythium. AFFC pathologists, Debra McLaren in Brandon and Bob Conner in Morden are conducting research into soybean root rot diseases, and samples are sent to them each year for analysis. In Manitoba, root disease surveys of soybean have been conducted with the assistance of staff from Manitoba Agriculture and the Manitoba Pulse & Soybean Growers. “Our research has shown that root rot of soybean in Western Canada is primarily caused by several species of fusarium,” says McLaren. Drs. Sheau-Fang Hwang and Kan-Fa Chang at the Crop Development Centre North in Edmonton recently reported on the occurrence of Fusarium proliferatum as a new root rot pathogen of soybean in Canada. 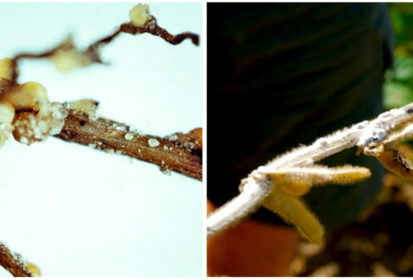 The same fusarium species can also cause damping-off or seedling blight of soybeans in which the seedlings die before or shortly after they emerge. Planting soybeans in warm, well-drained soils will reduce the severity of root diseases of soybeans. Agricultural practices that promote plant growth such as adequate soil fertilization and avoiding soil compaction and salinity will also reduce the adverse effects of root diseases on soybeans.